Transporting fat bikes is proving to be challenging for some riders, especially with the increasing popularity of these types of bikes. Bike rack companies are scrambling to address the need to haul bicycles with 4-5 inches wide tires. Fat bikes have wider tires and are heavier than other bikes, therefore, not any carrier will do the job. 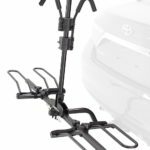 Bike carriers like Thule T2 or Kuat NV will be able to carry your fat-tire bicycle by default but for most of the carriers you will find in the market will use adapter parts to accommodate the style. 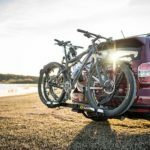 If you are looking to buy a new bike rack for your fat bike, here are some options organized by manufacturer. 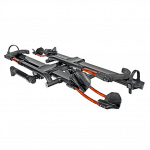 An ideal bike carrier for fat bikes, downhill, carbon frames and mountain bikes. Fits 20-29-inch wheels and up to 5-inch tires without adapters. You can adjust it and create space between bike mounts to eliminate bike interference. The distance between bikes: 12.5 inches. This is a 2-bike carrier but you can extend it to accommodate 4 bikes. Max bike weight: 60 lb. Like his companion, Thule T2 Pro Xt, this is an earlier version that can fit 1.25 and 2-inch receivers. 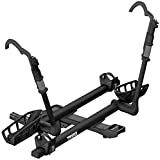 It is a hitch mount bike carrier considered to be one of the best bike racks for fat tire bikes. Thule T2 Classic can also accommodate downhill or carbon frame bikes, electric bikes, and heavy bikes in general without any adaptor. Max bike weight: 60 lb. A heavy-duty platform-style rack that mounts on 2-inch hitch, holds 2 or 4 bikes. The maximum weight per bike is 50 lbs. The maximum tire width: 3 inches. It comes pre-assembled and folds flat against vehicle when not in use. 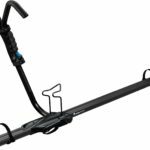 Trail rider is a fast loading platform hitch bike rack that carries 2 bikes and fits both 1.25 and 2-inch receiver. Supports up to 3-inch tire width and a maximum wheel base of 60-inches. Folds for garage storage. Additionally, you can buy the Hollywood Racks Fat Tire Wheel Holder Set that fit tires up to 5 inches wide and includes extra long wheel straps. Kuat NV 2.0 is a beautiful bike carrier and the upgraded Kuat NV version. It is a 2-bike capacity bike rack which can accommodate fat tire bikes with tires as large as 4.8 inches with Kuat Phat Bike Kit. Fits 20 to 29 inches tires while it features front tire ratchet design with intuitive release and a repair stand that you can use to fix your bike on the go. Saris come with SuperClamp 2-bike platform hitch rack that features no frame contact and integrated locks for bike and hitch. In order to use it with your fat bike you will need to buy the Saris Fat Tire Wheel Holder for each bike. Works with both 1.25 and 2 inches receiver and weighs 32 lb. If you are looking for a one-size-fits-all bike carrier or a roof bike rack, have a look at RockyMounts Brass Knuckles. This upright roof rack will accommodate fat bikes and all bikes with 20-29 inch wheels. It has a non-corrosive aluminum construction and you can purchase the very inexpensive expansion kit to carry your fat bike. We hope you found the perfect bike carrier for your fat bike and let us all know if there are other great options that we should know about. This entry was posted in Best Bike Carriers in 2018 and tagged fat bikes, fat tire bike racks.